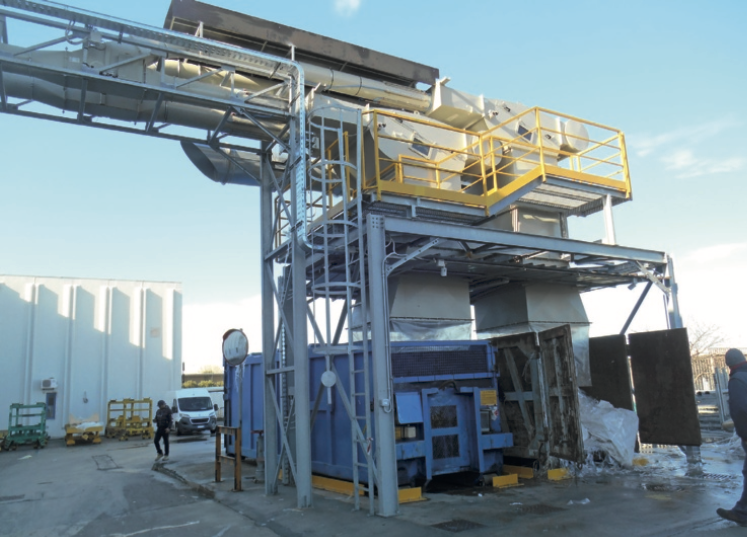 At the Jindal Films plant in Brindisi installed a new trimming suction system supplied by New Aerodinamica. Apparently simple operations such as cutting and trimming plastic films require careful planning and the same attention given to the other sections of the plant, if one wants to recover part of the costs - the trimmings have in fact an economic value - without slowing down production or jeopardize the quality of the finished product. That's why at the Jindal Films plant in Brindisi, where every year 35,000 tons of oriented polypropylene film are extruded, then lacquered and metallized, it was decided to replace the existing suction and conveying plant with a more performing one, supplied - after a race - from the Bergamo company New Aerodinamica. The order concerned the enslavement of two non-in-line cutters, to be equipped with a complete system of collection, transport and conferment in special bins of the trimmings. The demands of the filmmaker were not trivial: the speed of the cutters up to 1,200 meters per minute, the maximum width of the trimming equal to 50 mm, with different types of film and formats, noise contained within 87 dB and conveyance of trimmings to a hundred meters away from the cut, on the outside of the plant, crossed an internal road, where there are the storage bins. The piping of the trimmings should then be placed on a self-supporting galvanized IPE 180 rack with a useful light of about 8 meters. Furthermore, the presence of electrostatic charges should also be considered, with the consequent risks of packing. 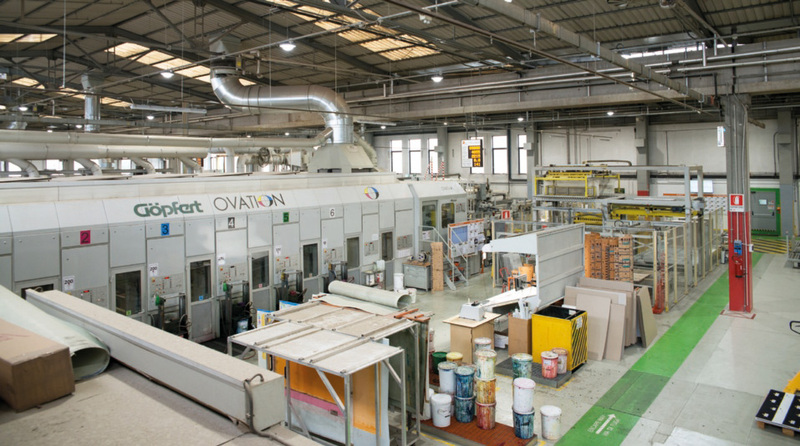 «Working in different sectors, we have gained a great experience in the design of customized systems, developing specific solutions for applications where speed is a critical factor, as in the paper industry, where the cutting and cutting centers work at 2,800 meters per minute »Comments Paolo Radaelli, CEO of New Aerodinamica (Casazza, in the province of Bergamo). "The Jindal plant therefore represented an interesting challenge, but within our reach". "Already at the initial proposal stage, New Aerodinamica's offer was distinguished by a series of technical measures that confirmed their effectiveness after months of operation", notes Giancarlo Laus of Jindal Films. «I am thinking, for example, of the special internal coating of the pipes, or the system for hooking and sealing the pipes. The "false air" system is very interesting, allowing the automatic adjustment of the trimming suction as a function of the machine speed, avoiding the clogging of the pipelines. We also appreciated the willingness of the designers to evaluate problems that could arise in the management of the system, such as noise, dust dispersion or ease of use. Each time, a solution was found that proved to be effective and was appreciated by the tenants ». When it comes to working alongside plastic film extrusion and converting plants, New Aerodinamica proposes its system with an injector, which allows continuous suction and transport of trimmings without the need to crush them. 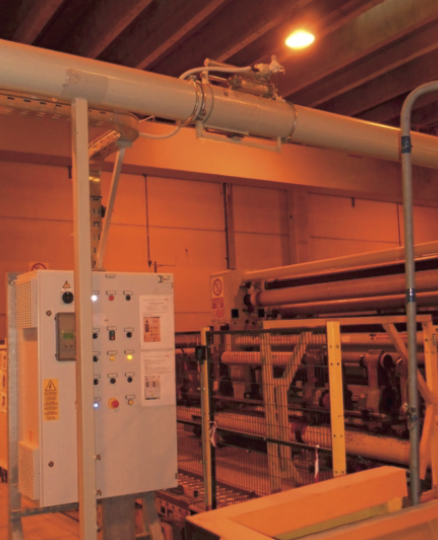 Solution that reduces maintenance interventions, since there are no mechanical parts, the setting of the equipment in the format changes (as regards the thickness of the film) and avoids the formation of dust in the ward. 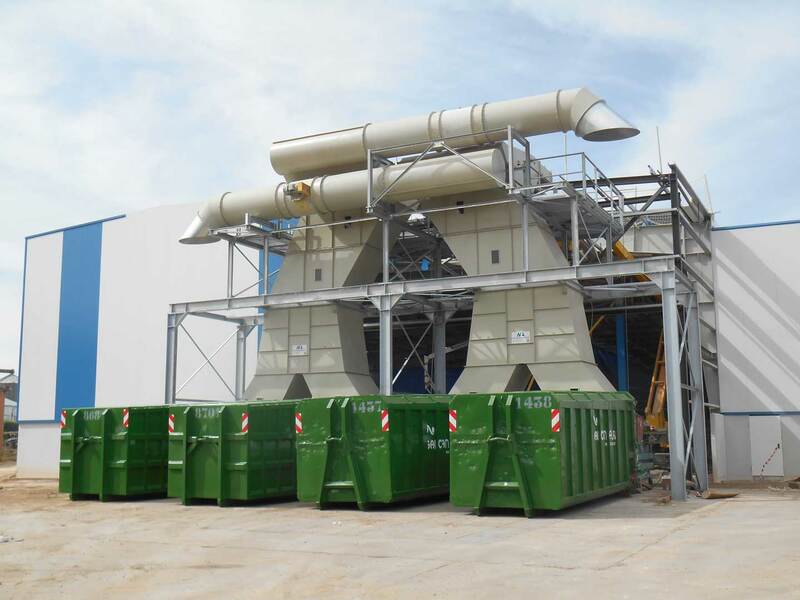 In this way, it is possible to place the collection bins even at distances of around 100 meters, keeping the noise level of the fans below the tolerance levels. Going into detail, the trimmings are sucked through two aerodynamic outlets designed to ensure a fluid capture of the materials. In the first cutting unit they are oriented upwards, in the second downwards, depending on the configuration of the machines. To facilitate the format change, the nozzles are mounted on a track that runs from one shoulder to the other of the system, on ball sliders. Special features of the nozzles proposed by New Aerodinamica is the "false air" device, with which it is possible to adjust the suction force according to the cutting speed, introducing ambient air just before the nozzles. This is because, if the fan is dimensioned at the maximum speed of the line, during the start-up and deceleration phases, a too vigorous suction could tear the trimming or create micro-cuts compromising the quality of the reel. Connected to the nozzles by a short section of metal ducts is the injector, which has the purpose of ensuring a continuous flow of plastic trimming up to the storage containers without the need to shred the material, thus avoiding risks of jamming and formation of powders. About ten meters away from the cutting plant is the cabin with the fan, driven by inverter motors in order to optimize the transport of the trimmings depending on the weight of the film and the speed of the line, thus reducing energy consumption . The fans are equipped with belt drive to avoid resonance effects and, therefore, annoying vibrations. At the request of the customer, the ventilation group has a low noise level of 70 dB, less than specified by the specifications (87 dB). Result obtained thanks to the soundproofing of the cabin with sandwich panels filled with compressed rock wool, 100 mm thick. Between the nozzles and the containers for the trimmings there are almost 90 meters of duct, which in part runs outside the ward (even by spilling an internal road). To guarantee performance and durability, the pipes are made of painted iron and not galvanized sheet, with air tightness up to 3 bar, both to ensure a more efficient transport of the trimming, and to prevent leakage of dust. The application of rubberized supports reduces vibrations and noise. 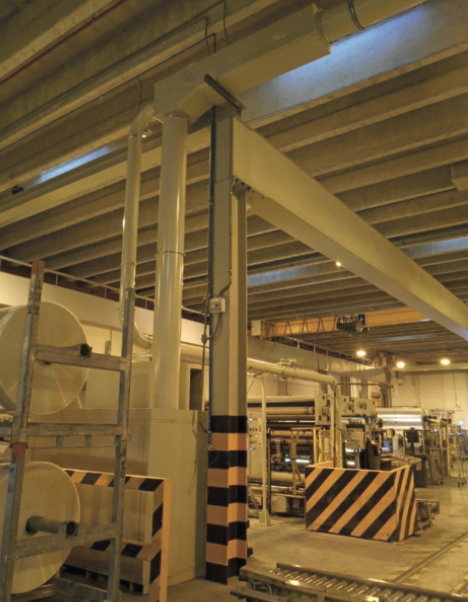 The exhaust group is supported by a hot galvanized metal structure equipped with access ladder and perimeter walkway. Ventilator in the cabin with silenced injector. Powered by inverter motors, it optimizes the transport of the trimmings depending on the weight of the film and the speed of the line. 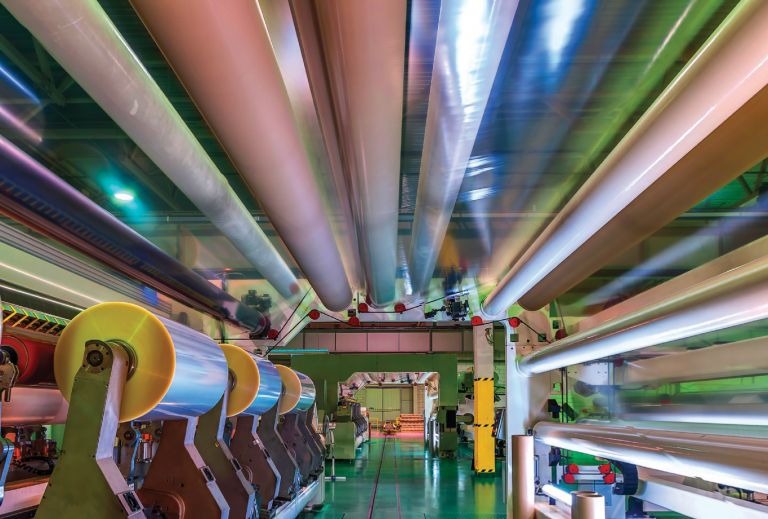 To avoid packing problems, since the film is lacquered by its electrostatic nature, different systems for reducing the charges have been adopted, through both active systems (antistatic bars and ionized air insufflation), and passive systems, such as the internal lining of the pipes. Outside the plant, in correspondence of the containers of destination of the trimmings, there are two aerodynamic separators, as each cutting unit can operate on two different types of film. Depending on the film being processed, the operator can select the destination bin through appropriate electro-pneumatic switches. 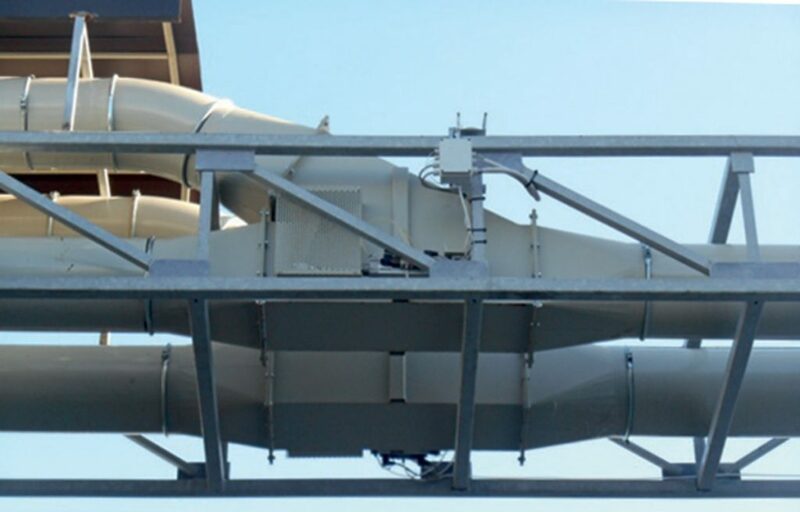 The separator operates without the aid of mechanical parts, as there are balancing fans (also these driven by an inverter) which provide for dropping the trimming by gravity. The exhaust group is supported by a hot galvanized metal structure with access ladder and perimeter walkway. 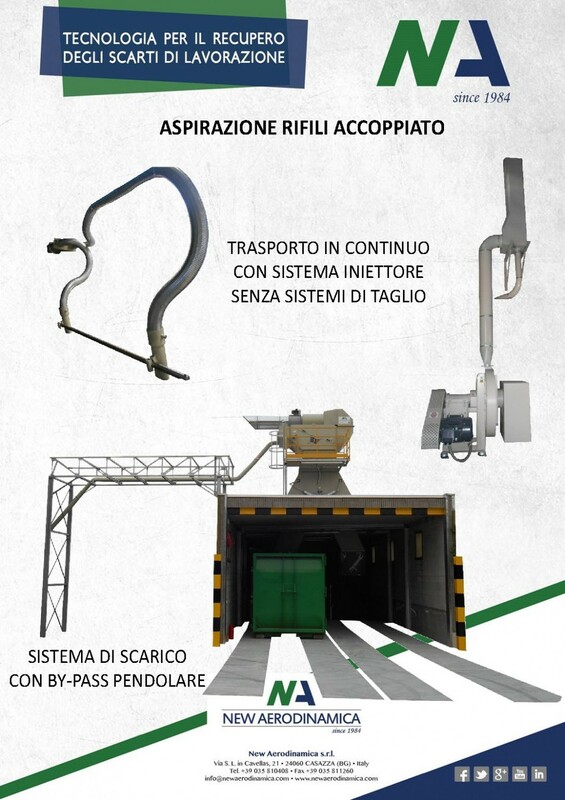 The structure has been designed with particular attention by New Aerodinamica, because it is considered a fundamental component: it makes the boxes totally independent and allows access to the separators in total safety for checks and maintenance. To achieve this, the manufacturer has carefully evaluated the choice of profiles (in this case IPE 220) based on the installation GPS position in order to evaluate any telluric movements, strength and direction winds. BUILDING AND STARTING WITHOUT DISABILITIES. The plant was entirely designed by New Aerodinamica, which also supplied machines and equipment for transport. The installation was instead taken care of by an assembly company chosen by the client. The construction and start-up of the new suction system required less than a month's work, without interrupting the activities in the cutting center, except for the half-day necessary to move from the old to the new outlets.